Lewis Carole had it wrong: “begin at the beginning” said the King to Alice. Writing 3000 sales presentations and critiquing the same number has taught me a lot, but if there is one thing that I know for certain it’s that most people start off wrong. Don’t write the first slide of your presentation first. Can they make a decision in the meeting? Do they need to see anything else before they can make their decision? So, tip #1 is to make sure you have a question to ask at the end of the presentation – your “close” – is SMART. Then you can start building a pitch. In searching for a value proposition, do not ask “What?” but “Why?” Why would the prospect give you the order for business? Most people believe that this is easy to articulate; right up to the moment their mouths open to do so and then they realise that what seemed obvious isn’t so. Rigour, challenge and persistence is my advice, keep asking “So What?” until you hear something that sounds like a good argument for action. Then collect tangible proof that you can deliver this value to the client. 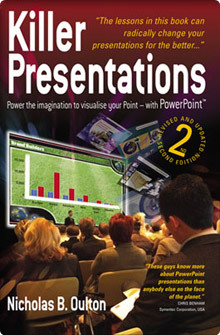 Once you have this, you pretty much have your presentation. You can write the introduction last, introducing the information the audience will need to understand. The arguments that follow should rapidly (less than 3 mins) establish empathy with the prospect and credibility for the presenter, organisation and solution. Clearly I could write a book about this (oh.. I have!) but that’s the 300 word summary. I Googled what I thought would bring me to the website of the creator of that diagram showing the depletion in Napoleon’s army going and returning from Russia. Instead, I got your site. I am trying to use it to depict for YouTube the development of the mind, and then how this explains what’s going on in politics today unconsciously. I’ll have to look around your site more, but so far, so good. I wanted to get your book, but $200+ was a lot–especially as I don’t read half the book I buy. So. . .
Do you have a CD or DVD set or something I can learn from that is less narrative, more graphic, and thus more relevant to the visual presentation mode than a book. And if you don’t, please think about developing one. I’d buy a $300 CD set before I’d allocate time and money for a trip to Liverpool.